So the reason is that I have started my own delivery kitchen in Santacruz - Mumbai. It's under the name of The Sindhi Kitchen. We specialize in Sindhi Food and have them delivered to your doorstep. Let's continue with the reason why you guys reading this are here. 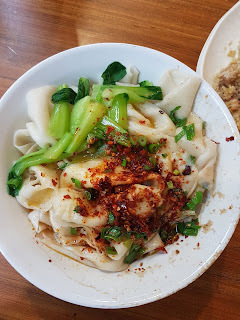 To know about my personal list of street foods that I love and I am sure some of you might also like it. 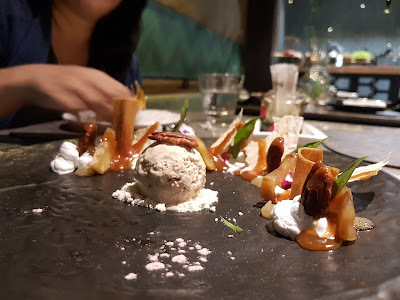 To start with, I might and might now have images of all the dishes that I am mentioning but I will try and add links either to google maps or Zomato or Facebook so that its easy for you to see the place, food and also get direction to reach them. With every place, there might and might not be a story also. I like telling stories and can continue writing once in that zone. If you read my Instagram, I am sure you will get what I am talking about. - I discovered this place thanks to a friend of mine. We were coming back from a screening and it was late and were super hungry, just then my friend suggested that lets have Black Pav Bhaji. At first, I was like, I have never tried it and don't know how it will taste but still, I took the risk and went to have it. The Misal has different levels of spiciness. You can ask them to add extra chili oil if you want crazy spicy or just take the normal one which is mild. 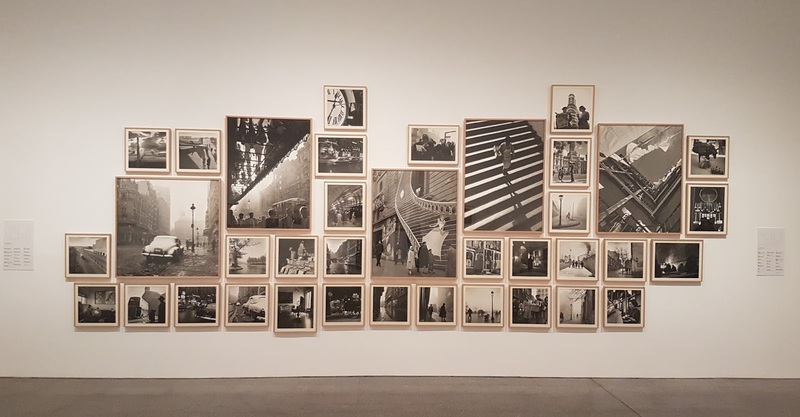 After I visiting the place for the first time, I couldn't stop and I am sure you will also want more of it and go again and again. Chicken Momos at Dev Momos - Worli - https://www.zomato.com/mumbai/devs-momo-hut-dadar-west. - This place has always been my favorite when it comes to desi momos. I remember there was a time, I used to call the guy up before leaving the home and tell them that I am reaching in 15 mins, keep 2 portions for me. Priced at INR 80 for 8 pieces of Chicken Momos is totally worth it. Do not forget to ask them to give you extra sauce. The sauce is just heavenly and mind-blowingly good and I can go on and on. I used to have 2 portions of this and my dinner was done. This place is always my go-to place for the momos. Remember that at times it can get a bit difficult to spot the guy as there is just one steamer by the footpath and a lot of cars at times cover him. I love exploring food on the streets and hence the post. Manju Dosa was introduced to me by my grand mom, Yes my grandmom told me about this about 6 years ago when she had go the dosas home after her evening drive. After that day, I have been trying different different dosas here and hands down the best one is the Mysore Masala Dosa. The Masala is spicy, just the way I like my food. Also, the other best part is that is very close to my Kitchen (Remember I mentioned about it right at the start). I keep ordering from these guys at least once a week and try a new one every time. - This is just the place one needs to visit if he/she is looking for Vada Pao. I have been visiting this place for years (almost 7 years) ever since I and my brother passed the shop and tried it. Priced at INR 20, the vada pao is filling, tasty and finger licking good. There have been times when I have sent this vada pao to Dubai as well for my family there. So you can imagine how good it is. They have a small rule, if there is no chura left, they will not serve vada pao so you will have to wait till the time more chura is made. - I remember this place because my school was just 2 mins walk from here. We as kids used to save the pocket money and go and eat here every alternate week. It was priced at INR 30 for the chicken frankie and I am talking about 8-9 years. Currently, its priced at INR 80 if I remember. The frankie was spicy, tangy and filling. The fried egg in the middle made it even better. I have tried their classic aloo and vegetable frankie and their chicken frankie and both of them were pretty good. These days also if I am craving for some good rolls/frankie, Tibs is always my first choice. With this not soo small list, I will end my part 1 of the street food series. 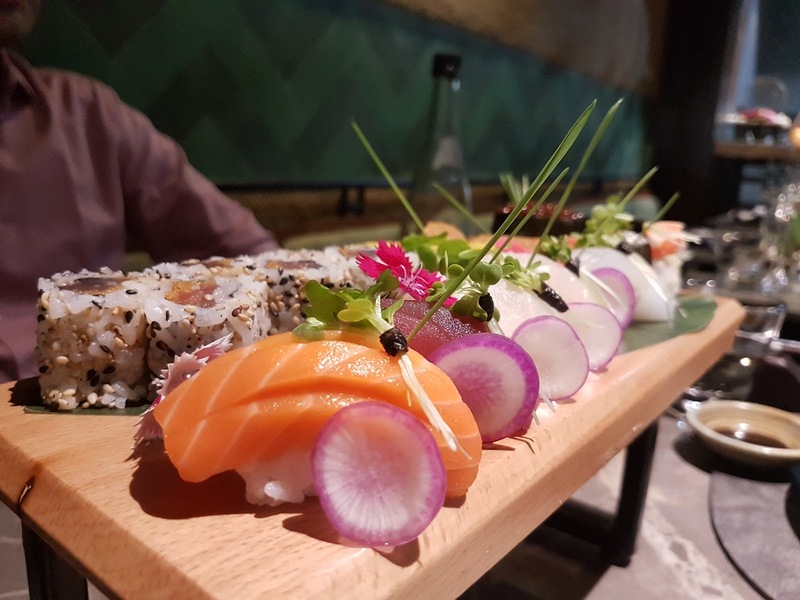 I will keep adding more and publishing another post so that all you readers can try some of my favorite food spots. The year 2017 ended on quite an amazing note. The people who know me will tell you that I prefer traveling solo and exploring the places and that's what I did somewhere in the middle of 2017, booked myself a ticket to Spain to explore the country. But the year ended with another trip that I made and it was not a solo trip but with family. I am glad it was a family trip, it was more fun, and I got to eat my mothers made Dal Kichdi (trust me, it's amazing and it's my favorite dish). 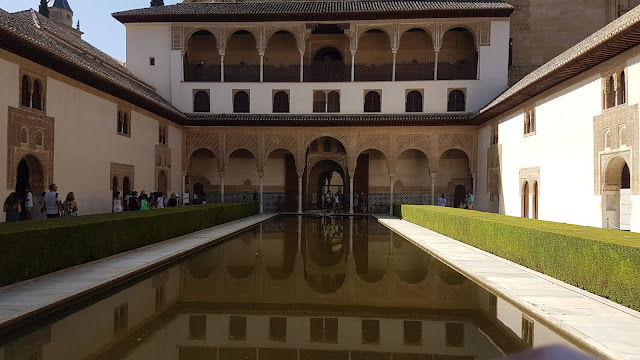 I was there for only 5 days and tried to cover as much as I could but whatever I saw, I enjoyed it and personally, I would love to visit the place again in order to try more stuff. But I have a list of 10 things one should do in Singapore. This includes food, shopping, nightlight, and adventure as well. Also a bit of sightseeing. Lets being with the food part first because I love food and I travel for that mainly. Flat Noodles with Chili and Green. China Town is one amazing place for people who enjoy the food. The place is not only about food, there are places where one can go and shop for things as well. One great thing I had there was the candided bbq pork and chicken floss. I know it sounds weird but tasted really good. If you are a Tintin fan, please note that it is the only Tintin store in Asia. 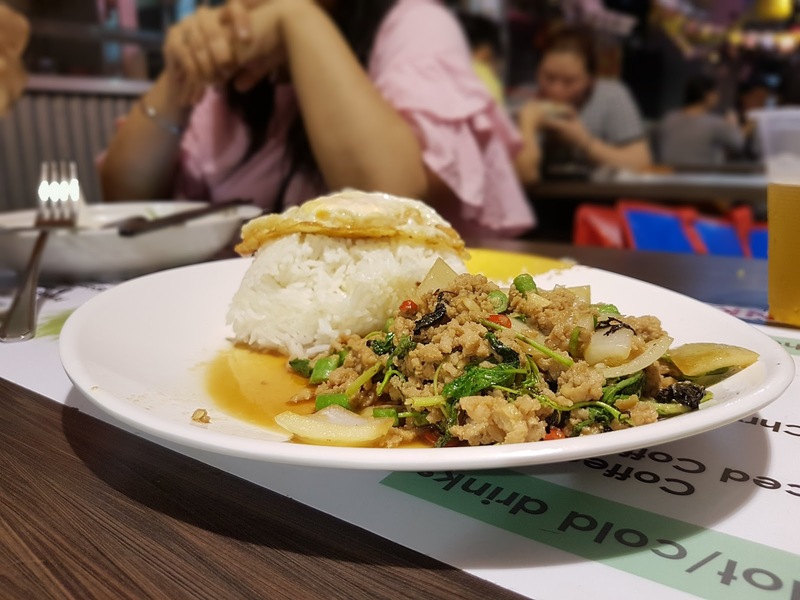 There are innumerous restaurants as you walk along the streets in the area that will serve some amazing food and I can tell this because of the aromas that you get to smell by just walking around. 2. Bugis Street and Albert Center. Bugis Street is known for cheap shopping, a place where you can bargain (I tried that but didn't get much success). This is a 3-floor mall kind of area where you will find things from clothes to electronics to souvenirs to food items. It also has a small food-court and there are a few things that I tried there and it was pretty good. 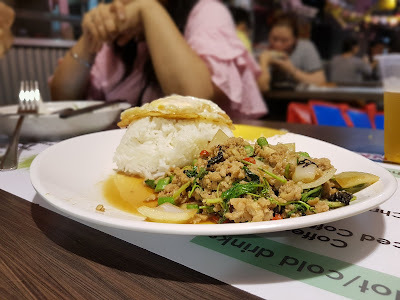 At one of the food spaces there, I ordered the som tam salad and a portion or Thai style basil chicken and jasmine rice, trust me when I say that the basil chicken was just amazing and flavourful. I liked the area soo much, I went there almost 3 times during my 7-day stay. 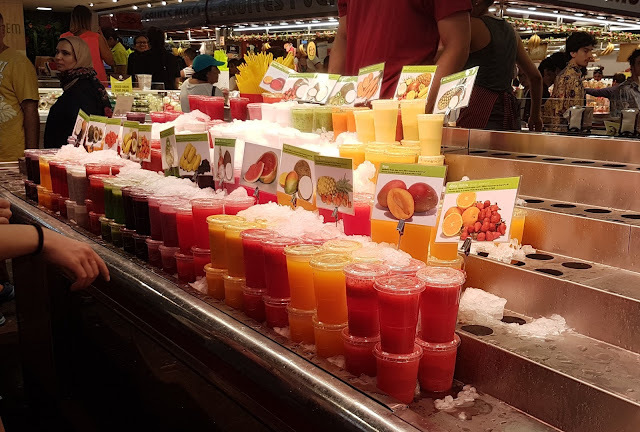 Also, before you enter, there is a fruit market and the fruits looked lovely and fresh. I just picked up some mangoes and persimmons and while eating them back at the hotel, they did taste good. 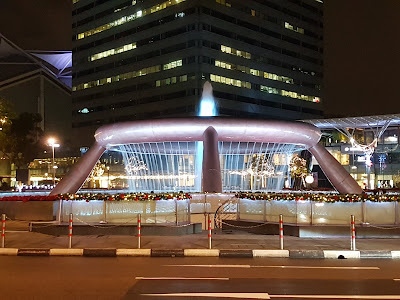 Albert Center, this is just opposite Bugis street and is filled with hawkers who serve food of the locals, from the neighboring countries and regions. This place is I guess a 6 level building, can't remember clearly, but I can say it has quite a lot of food for sure. P.S. there is also a 1$ shop next to the street, you should check it out. 3. Gardens By The Bay and Singapore Flyer. 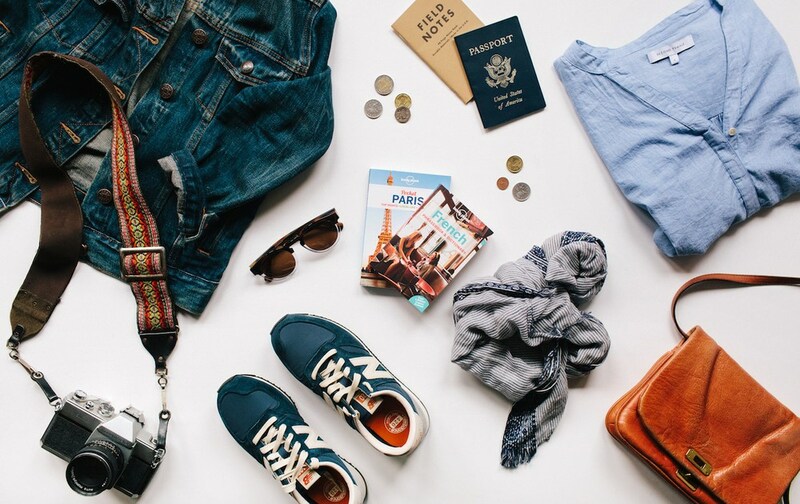 Want to do all the touristy stuff then these two places are for sure to be on your list. They do not need much introduction but will give a basic idea to all those who aren't aware. SuperTree Grove and OCBC Sky Walk. know in the comments below. I forgot the name. For all those who love shopping, this point is for them. Personally, I am not one who loves shopping and roaming around the mall. As mentioned, I was traveling with family and some of them love to shop and shop and shop. There are a lot of options spread across Singapore for shopping, some of them that I visited was Vivo City Malls, Raffles Center, did take a round of the Orchard Street which is known for its shopping and has great brands and pretty good looking shopping centers. Also, there is one place that most Indians love visiting and i.e. Mustafa Center. Mustafa Center is spread across like 3 buildings which are interconnected. The place is open 24x7 and one can find anything and everything here, right from clothes to electronics to grocery, you name it and it might be there. I have seen people come with empty luggage bags and have filled them and left. I did spend here a couple of hours but could just see only 1/3rd of the center. So it is on my list to check out the rest of the center when I visit next. Singapore has something for everyone, some love eating, some love shopping and some love partying and exploring the nightlife as well. 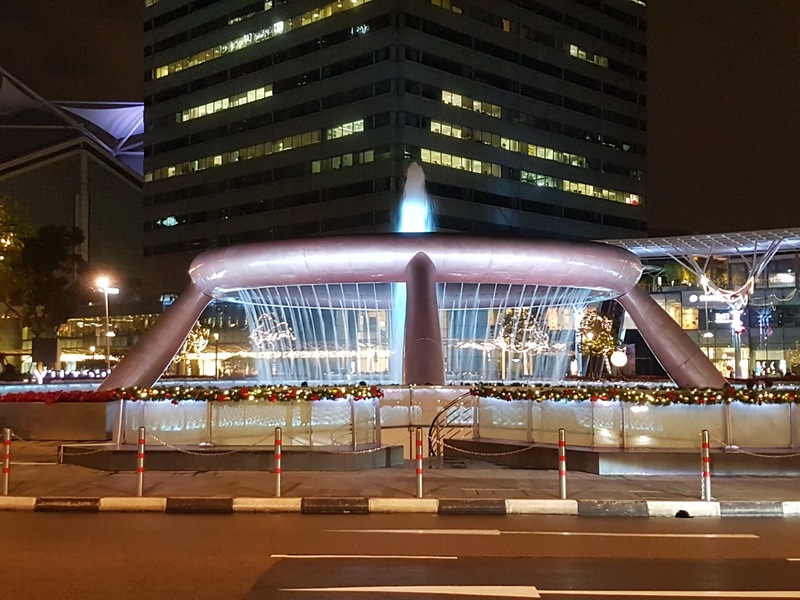 If you are one of those who enjoys partying, Clarke Quay is the area to be in. The area is filled with restaurants, bars, and pubs and they are damn crowded on weekends. 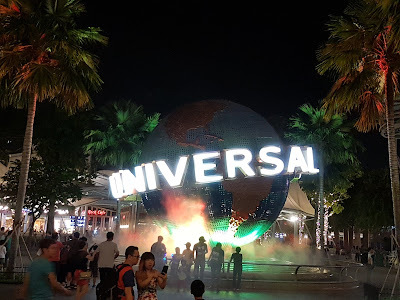 As I was traveling with family, didn't get much chance to explore the nightlife but I did take a walk around this area one late evening and even tried the food a couple of places and it did not disappoint me. 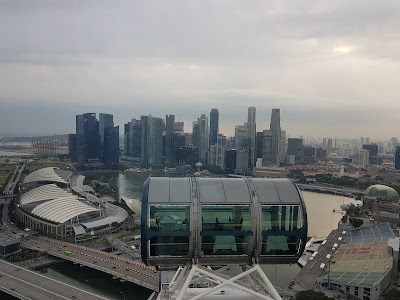 I have this on my list again for the next time I am in Singapore, in fact, the list keeps increasing as I keep writing the article because a lot of things come to the mind that needs to be covered. Two more attractions that one can add on to their itinerary if they want to do tourist stuff. 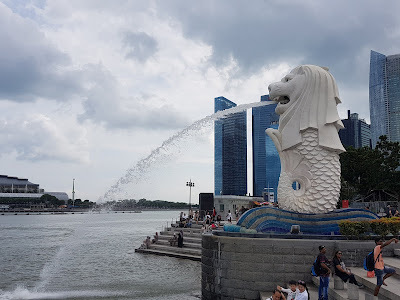 Believe it or not, going and checking the Merlion out was on my list ever since the discussion of visiting Singapore started on our family whatsapp group. I even took a picture where the water is coming directly into my mouth as if I am drinking it, I know it sounds so not like me but had to do something crazy (I am not sharing that image anywhere, not even on my instagram handle). Marina Bay Sands was something I wanted to visit from a long time, have a look at the view from the top, visit the casino and maybe play a few hands as well and also just to tick it off my list (touristy stuff), but due to some family issues, couldn't make it and had to cancel the plan at the last minute. This gives me another reason to visit Singapore soon and explore all those things I have missed or couldn't see due to various reasons. Another great attraction for all the tourists is the Universal Studios. This is a fun place to spend the day and for people who like adventure in terms of rides and roller coasters, then this is the place to visit. Make sure you take the express pass if you want to try and cover up the whole of the Universal Studios because the queues can be a pain at times. You can purchase the tickets online, this will save you time at the entrance. This might take up your entire day if you plan to visit all the rides. If you are a foodie like me, then you must visit the cheapest Michelin Star place in the world. It is a hawker who serves amazing chicken and rice. Be careful, you might have to wait in the queue for some time but it was worth it because I was hungry as well. Night Safari & Singapore Zoo - animal lover?, then you have to visit the place. The night safari also has long queues but if you run towards the bus, you might get a seat on the bus soon. They also have a trekking path for people who want to explore the wildlife on the foot. You can stop various animals and for them, the park is made in such a way that it looks like a jungle. Singapore Sling - the National Drink of Singapore. It is said that the drink was created on the occasion when the treaty was signed. Raffles Hotel is the place where it was invented. I quite liked the drink that I had a couple of them on my way back on the flight. Just like how Vada Pao is to Mumbai, Kaya Toast and Milo is to Singapore. 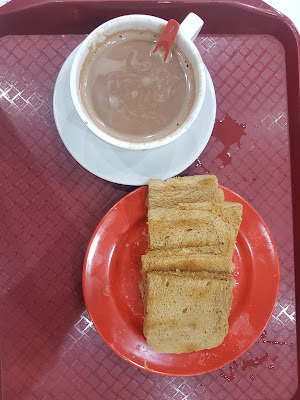 One can find Kaya Toast with Soft Boiled Runny Eggs and Milo at many places across the town. I quite liked it, I, in fact, made some Kaya Jam at home and had it spread over bread and had it. Banh Mi - This is one of my favorite sandwiches and I have had it in Hongkong, Bangkok and then in Singapore. Crusty bread with meat, pickle and fresh cilantro, just perfect. 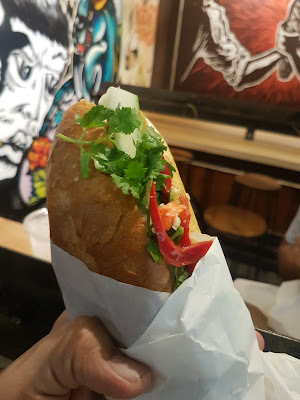 I tried the same at two places in Singapore but the one at Banh Mi Brother was quite good. They are located at Income By Raffles. 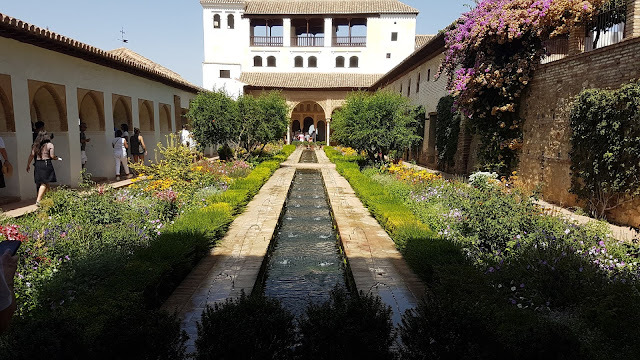 So that's all FOLKS, I have tried to list down as must as I could remember but in case I visit again and explore new places, I will surely share it with you all on the blog. But you can follow me on my social media handles for regular updates on food and more. To all those reading this article, there is one question that I would like to ask you all. How many of you have gone back home after dining out and raved about it? It has to be one of those meals that you will remember always and not stop telling people about it. To begin with, there are 4 places that come to mind and they are as below. These are the places that I will always remember and I have been raving about them quite a lot to my friends, colleagues and at times random people on who ask for suggestions on social media platforms. 2. Gaggan - Bangkok - 2016 (yes, I dined at Gaggan and it was on my Birthday). The experience at Smoke House Deli was a food review I had attended (Perks of being a food blogger) and the restaurant wasn't aware of it. I already have a post written about it, you can click here and check it but I will still throw in a short review about the place here, like a summary. I was dining it at the place with a friend of mine and we had decided to meet each other at the restaurant. Only after reaching the place, I realized, we are at the wrong outlet (it was my fault, back then I was bad with such things according to some of my friends). Somehow we managed to reach the correct outlet in time to order and enjoy the food. It was kinda dicey to pick as to what we should order so we just asked the servers to suggest some and we are glad that we let them help us here. - This I can say hands down was the best dish I had here. Personally, had never imagined Aubergine being served like this. 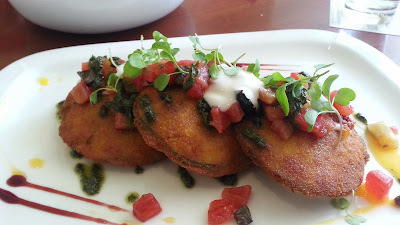 The outside was crispy yet soft and gooey in the center due to the molten cheese. I tried to replicate the dish at home the very next day and failed miserably. It's time I give it another try. 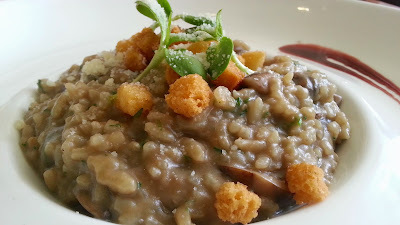 - Cooked perfectly, Al dente and creamy, this risotto was the 3rd best thing I had (2nd was the Pannacotta). The flavors were earthy from all the mushrooms that they had used while making it and was just spot on. - Jiggle is one thing that will make it sure if the Pannacotta you are eating is good or no. This one was just what I was expecting, had very clean flavors and that lovely JIGGLE. The next was my birthday meal at Gaggan, I had made a note that I have to dine in here ever since I had heard about it. So for one of my annual birthday trips, I had a stop in Bangkok and I made a reservation to eat here. I can say for sure, its one great meal and an amazing experience. I couldn't have asked more on that day and it was the perfect way to treat myself. 1. The signature - Yogurt Explosion. - This will just explode like a bomb in your mouth and leave it with the chatpata (Umami of the Indians) flavors. I did try making this at home and did come close but not the same though. - Never imagined a sundae to be like this and served with a portion of sea urchin i.e. Uni. It was the first time I had it and didn't know what it was until I came back home and read about it. Trust me it was good in a weird way but it was worth trying. Two experiences are down and two more to rave about. The next on the list as mentioned above is the food at Olive Kitchen and Bar in Bandra - Mumbai. This is one of those places where I will want to go back for the food and the whole experience. Right from the 1st course till the last course, each of them was just getting better and better and better. Here I am just going to write about 3 of the many dishes tried, not that others weren't good but these were just, just amazing. 1. 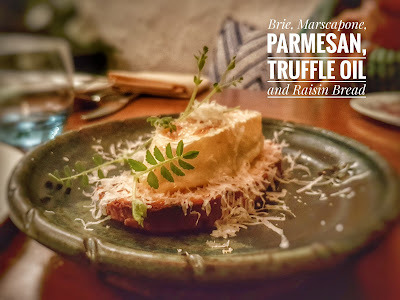 Brie, Mascarpone & Parmesan on Raisin Bread - Perfectly toasted bread with a huge piece of Brie cheese which was warm and then there was creamy mascarpone cheese and then there was the nutty parmesan cheese. The delight for a cheese lover. The best part was the gooey Brie cheese. BTW the bread was also made in-house. 2. 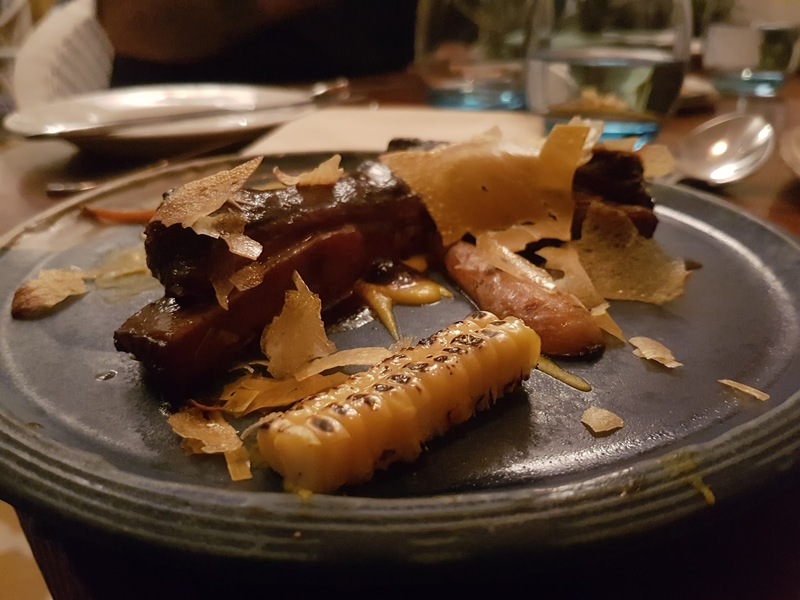 Baby Lamb Ribs with Sweet Corn Miso and Charred Corn. - That Sweet Corn Miso was just spot on and my mouth is watering. The ribs were cooked to perfection. The only thing disappointing on this dish was why didn't I get more of that miso corn (there was a generous portion already but I needed more). 3. Duck Bacon Fettucine Carbonara. - This has been the best Fettucine I have ever had. In-house made pasta tossed along with creamy carbonara made using the duck fat and bits and pieces of duck which were tender and would just dissolve in your mouth. If you are going here, this is the dish you need to have for sure. It's about the most recent meal and the final meal that I have to rave about in this post. It was at the newly opened POH - Progressive Oriental House in Mumbai. Ever since the place opened up and I saw the images and read about it, the restaurant was on my radar to visit and eat some delicious Oriental food. To be honest, there was a lot I ate and I can't really remember the names of all the dishes I had but the best ones are what I remember and here's the list. So the thing is I don't have photos of the dishes listed below but of some other dishes, I had as well. 1. Crispy Duck - The meat was so tender and cooked in such a way that it would just melt in your mouth. Confused with the same crispy duck right, the meat was melt in the mouth but the skin was crispy, so it was the perfect balance of textures when you eat the dish as a whole. It is the best duck dish I have ever had. Sichuan Pepper & Poached Apple. 2. Pork Belly with Vanilla Pomelo Salad - Another soft, juicy and cooked to perfection dish. The cubes of Pork Belly would just fall off the stick on which it was served. Also never had I imagined that the vanilla being used in such a way with the pomelo to compliment the pork. If you love Pork then it is a must try dish. 3. White Peppercorn Ice Cream - This does sound weird but tastes heavenly. The moment I read it on the menu, I was a bit skeptical as to if I should order it or no but I'm glad I ordered it. The ice cream was creamy, smooth, had the right amount of sweetness and just the perfect kick from the white peppercorn. So these were some of the best meals I have had to date. Also, I have an idea in my mind where I am thinking of doing a post like this every year focusing on the best restaurants I have visited in that span of a year and then put it up. Let me know if you think it is interesting you would like to read about it. Also if you have had such a great meal, do let me know about it in the comments below.